Competitive vaping is a thing. 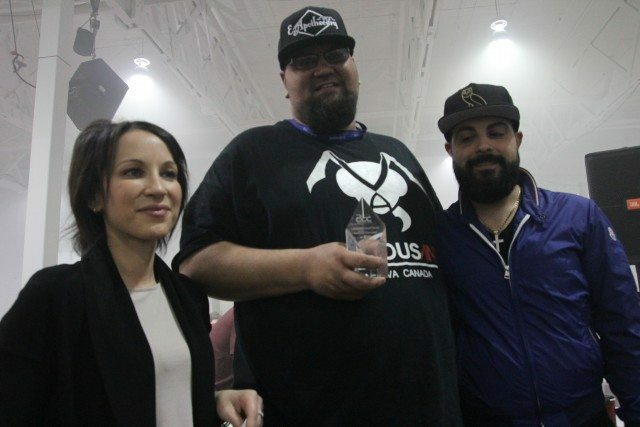 Past the vendors and industry insiders, the backroom at the Canadian Cloud Circuit was filled with smoke. 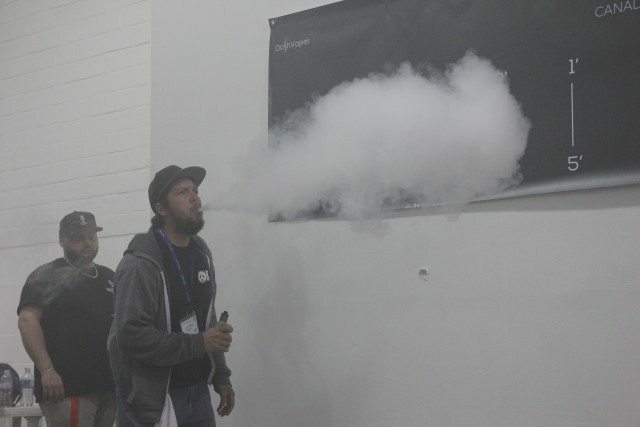 Held in May in conjunction with the Canadian Vape Expo, Canada’s leading e-cigarette trade show, the CCC attracted the very best vapers in the country. After all, money and glory was on the line for the rival cloud chasers, who take long hauls and try to blow the biggest cloud. If you’re going to be into vaping, you may as well be the very best at it. The CCC started in 2015, and had a grand prize of $1,000. Reflecting the industry’s rise, the prizes were higher this year, with $10,000 awarded to the winner. Second and third place finishers would walk away with $2,500 and $1,000, respectively. Competitive tournaments have their favourites going into them, the person that the rest of the field admires or fears. In women’s tennis, it’s Serena Williams. In Scrabble, it’s Nigel Richards. For Canadian vaping, it’s Daryl Mccoy. For Mccoy, the convention was full of familiar faces. Walking through the rows of booths was an exercise in constant hand shaking and head nodding. A truck driver, Mccoy is tall and wide, but his demeanour is anything but imposing. He smiles constantly and uses a similar vocabulary to Ned Flanders. But when it comes to vaping, Mccoy has shows his competitive side, and takes it seriously. “Any time I hear about a competition I’m there,” he says—partially for the community, partially for the fun of winning, and partially because he doesn’t know how long the competitions will last. “I don’t know how many more there’s going to be,” he says. His concern for the longevity of the craft is warranted. An amendment to the Smoke-Free Ontario Act makes it so that people can’t smoke at vapour lounges or sample products at vape shops. For Mccoy, the problem lies in not being able to taste the vapour beforehand will turn people off of vaping before they have a chance to quit smoking. With all the vapes inspected it was time to start the competition. The 10 cloud chasers were selected in a random order, and each blew a cloud as large as they could along a black ruler that had been taped on the wall. After winning the competition the year before Mccoy was the favourite, but Mike Swain, a ringer who was flown in from Manitoba by the CCC, convincingly won the first round. Mike Swain blowing an early cloud. After two more rounds, the judges tallied the scores and the four cloud chasers behind Swain, including Mccoy, were all tied. This called for an extra round where the competitors stood back to back and blew three clouds each. Whoever won two out of three moved on to the money rounds. The loser would go home. Mccoy’s friendly demeanour and smile was gone now. “The thought of not making the money rounds made me really nervous,” he says. He prevailed, but just barely. With the final four set Mccoy and Swain, who had dominated the competition, faced off against each other in the semi-final. The setup was the same as the overtime cloud-off, as the chasers stood back to back and let their clouds loose. This was not without controversy. The pair went 1-1 when blowing in front of the measuring tape on the wall, and Mccoy stopped to inform the judges that a draft was making difficult for the person blowing to the right to keep their cloud intact. After some quiet murmuring from the judges and organizers, they agreed to start the round fresh, and let the pair go up on the mainstage of the event to blow their clouds. The first blow went to Swain, but only after the judges watched the clouds again on a spectator’s iPhone as an impromptu video review. Mccoy won the second, again after some video review. A hush fell over the small but enthusiastic crowd watching the competition before the final blow. It felt like the third period of the 1980 Olympic semi-finals between the Soviets and Americans, except, you know, with vaping. The pair sucked on their devices, and let the decisive clouds fly. Each judge announced their pick for the winner individually. The fifth judge announced Mccoy’s name, and punched his ticket to the final round. Mccoy, too, would breeze past his competitor in the final round, winning twice in a row in unanimous decisions from the judges. His smile was back, much bigger than before. Daryl was mobbed by company representatives who offered him some free liquids and other merchandise after he won. Then came an official cheque presentation, which was actually just a regular cheque, and not the novelty giant ones some of the competitors were looking forward to. Mccoy stayed on the stage for a while after the others had left. As soon as he had a minute alone, he whipped out his phone and called his wife, who at home looking after their son and pregnant with another child. “It feels great, we got a family trip coming up in February, so that’s all paid for now!” He said. It may be the last competition of its kind in Ontario. None of that concerned McCoy though. Even if he was the last cloud chasing champion in Toronto, he enjoyed the ride. Did you like this article? Support articles like this by becoming a Torontoist patron. Get great perks and fund local journalism that makes a difference—join Raccoon Nation now.